Donnie Wahlberg is an American singer, actor, and film producer who made his acting debut in the 1996 film, Bullet. His other notable works include The Sixth Sense, Blue Bloods and Saw II. An American singer, actor, and film producer. There were several rumors which suggested that Wahlberg might be gay. However, his recent relationships and marriage suggest otherwise. At present, there are no rumors concerning Wahlberg’s life and career. Donnie Wahlberg was born as Donald Edmond Wahlberg Jr. in Boston, Massachusetts under the birth sign Leo. He is the son of Alma Wahlberg and Donald Edmund Wahlberg Sr. His mother, Alma was a bank clerk whereas his father, Donald was a teamster who died in 2008. His parents divorced in 1982. After the separation, he started living with his mother. His eight siblings are Paul, Robert, Tracey, Michelle, Arthur, Jim, Debbie, and Mark. He developed a keen interest in acting since his childhood years. He is of American nationality. Furthermore, he belongs to a mixed ethnic background of Irish, Swedish, English, French-Canadian, and Scottish. Talking about his education, Wahlberg attended William Monroe Trotter School. Additionally, he also attended Copley High School. Donnie Wahlberg’s band New Kids on the Block has released several albums to date. The band’s released albums are ‘New Kids on the Block’, ‘Hangin’ Tough’, ‘Step by Step’, ‘Face the Music’, ‘The Block’, ‘10’, and ‘Thankful (EP)’. Apart from his career in music, he has also appeared in several movies and television series. He appeared as Big Balls in ‘Bullet’ in 1996. Additionally, Wahlberg also appeared in ‘Ransom’, ‘’ Black Circle Boys’, and ‘The Taking of Pelham One Two Three’. Since then, he has appeared in numerous other movies and television series. Furthermore, he has also produced several movies and television series. All in all, he has over 60 credits as an actor. Some other movies and television series that he has appeared in are ‘Blue Bloods’, ‘Return of the Mac’, ‘Fuller House’, ‘Boston’s Finest’, ‘Massholes’, ‘Zookeeper’, ‘Rizzoli & Isles’, ‘Bunker Hill’, ‘Runaway’, ‘Righteous Kill’, ‘Saw IV’, ‘The Kill Point’, ‘Dead Silence’, ‘Kings of South Beach’, ‘Annapolis’, ‘Marilyn Hotchkiss’ Ballroom Dancing & Charm School’, ‘Boomtown’, ‘Dreamcatcher’, ‘UC: Undercover’, ‘Triggermen’, ‘Band of Brothers’, ‘Big Apple’, ‘Diamond Men’, ‘Butter’, and ‘Body Count’ among others. Furthermore, he also has 6 credits as a producer and 4 credits as a director. He has garnered two Primetime Emmy Award nominations. Additionally, he also has ACCA Award nominations and People’s Choice Award nominations. All in all, he has 5 nominations to his name. 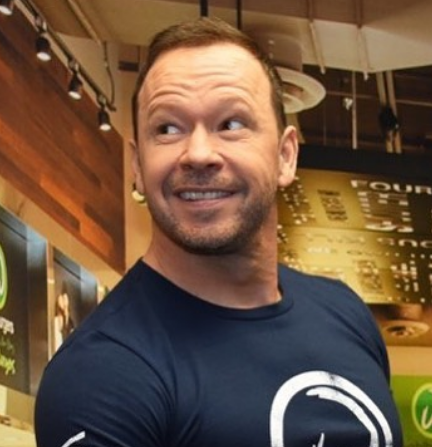 As per some sources, Donnie Wahlberg earns too much salary from his multiple careers. He has an estimated net worth of $20 million as of 2018. Donnie Wahlberg was previously married to Kimberly Fey. The pair were together from 20 August 1999 to 28 September 2010. They have two children from this marriage, Xavier Alexander Wahlberg and Elijah Hendrix Wahlberg. Wahlberg also dated Aubrey O`Day for a brief amount of time. At present, he is married to actress Jenny McCarthy. The couple married on 31 August 2014. Their marriage is going strong as there is no news regarding any extramarital affairs at present. In addition, The famous actor is involved in several charity works. He supports Generation Rescue which is a movement dedicated to providing treatment opportunities to autism families. Beside, he is active over the social media. He has a huge number of followers on social networking sites such as Facebook, Twitter as well as Instagram. He has more than 1.4M followers on Twitter. In addition, he has more than 1M followers on Instagram. Similarly, his Facebook page has more than 895k followers. Talking about his body measurement, Wahlberg has a height of 5 feet 10 inches (1.78 m). Additionally, he weighs around 82 kg. Furthermore, his hair color is light brown and his eye color is dark brown.